Inspired by cultural, historical and artistic themes, Misun Yum unique style combines fashion with art and continuously pursues new design methods. Yum prioritizes materials and colors in the collections she creates. 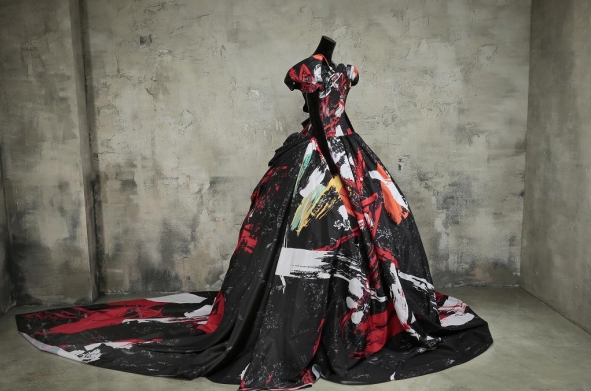 Using computer graphics and digital textile printing, she makes ready-to-wear and Haute Couture in various genres. She in depth examination into the concepts that inspire her has helped keep her work new and fresh. Presently, Yum has made a new start. For the last two years, she has been invited to exhibit her work in Russia's Fashion Week. In April 2015, she had a fashion show in Russia. Her exhibition in New York, Yum will display a new Haute Couture collection, Beyond Fashion. She used images from the paintings of Professor Irina Miklushevskaya from the Stroganov Moscow State Academy of Art and Industry to develop a new line of work. The exhibition includes fifteen new pieces inspired by the New Look of Christian Dior, and the voluminous silhouettes of 19th century Europe, both of which emphasize elegant and feminine lines. The dresses, which are made of silk-taffeta, organza, embroidered lace, Jacquard silk and tulle, evoke a luxurious and sophisticated feel. In this most recent collection, Yum features a backless dress, the undulating form of a fishtail silhouette, voluminous skirts from the New Look, and feminine and elegant dresses with slim waistlines. The dresses trace past and present influences and in doing so, reinterpret fashion. Yum has been dedicated to her passion of blurring the lines between fashion and art, and history and the present. As she moves forward from this exhibition, she will keep exploring and searching for new ways to reflect on and express her worldview. Misun Yum, Ph.D., is a Korean fashion designer and professor who have four degrees in fashion design, including an associate degree in science from New York's Fashion Institute of Technology, and she has exhibited globally in solo and group exhibitions.